The core buildings of Newnham College were the work of one architect, Basil Champneys, who worked with the College for over thirty five years from 1874 to 1910. Old Hall was built in 1875; Sidgwick in 1880; Clough in 1888, the original Library 1897; Kennedy in 1905; and Peile in 1910. 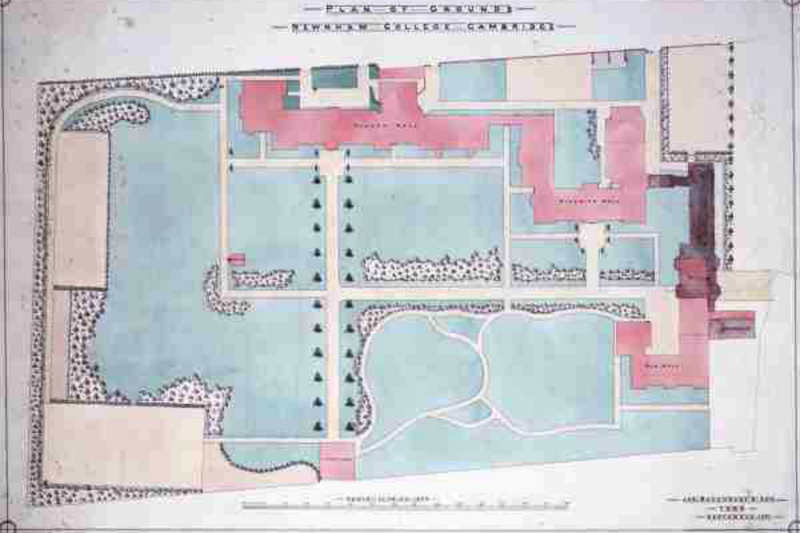 This plan shows the original design of the garden. The layout of the main paths was adopted and remains to this day. The meandering walks at the bottom of the plan were designed for strolling. North Hall (now Old Hall), South Hall (now Sidgwick), College Hall (now Clough Hall) are shown in pink. Also in pink are shown the Chemistry Laboratories (at the bottom of the plan) and the Observatory (in the centre of the large lawn on the left). 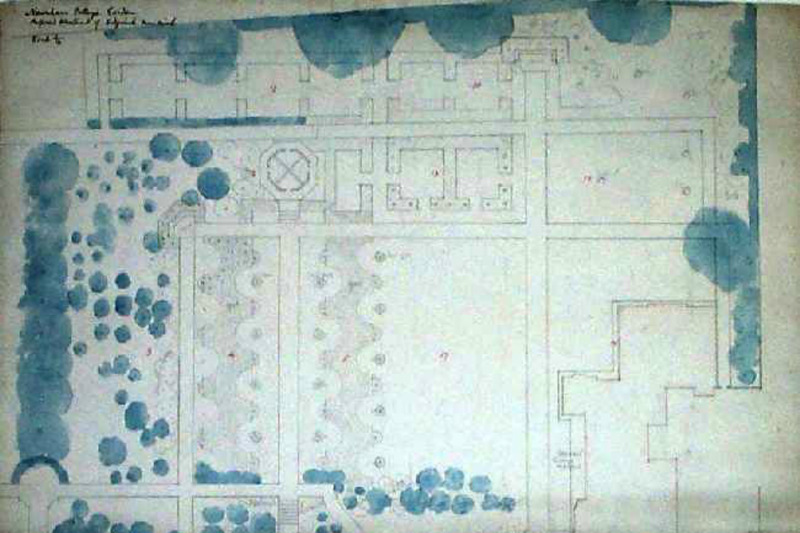 This is a plan of the garden redesign by Alfred H Powell in 1906. Note that North is towards the bottom). In this design, the paths were all to be straightened and vistas realigned. Some of the plan was adopted – for example, a sunken pool in front of Sidgwick Hall was dedicated as a memorial to Henry Sidgwick, with a carved inscription by Eric Gill: “The daughters of this house to those that shall come after them commend the filial remembrance of Henry Sidgwick”. The interrupted yew hedge and the formal rose garden was also planted as part of the memorial to Henry Sidgwick. The Observatory and mound were formally incorporated into the garden design, and the avenue was planted with trees. But few of the other components of this plan were implemented. In 1911, the College asked Gertrude Jekyll, the famous Edwardian landscape designer to prepare a plan for the gardens. The plan for the area in front of Peile is shown below (once again, North is to the bottom of the page). A central feature of the plan was two summerhouses, to have been designed by Edward Lutyens. This plan was never implemented, and no design for the summerhouses exists. A garden plan was adopted, but it was not the one proposed by Gertrude Jekyll. Her idea of herbaceous borders, however, was adopted and embraced by Newnham, which is now famous for its borders. Here and there traces of the past can be found. A rusty iron fence to the south of Old Hall was the boundary of the first two and a half acres leased by the Newnham Hall Company from St John’s in 1874. In 1892, the Chair of the Garden Committee, Blanche Athena Clough, decided to start planning the College gardens. 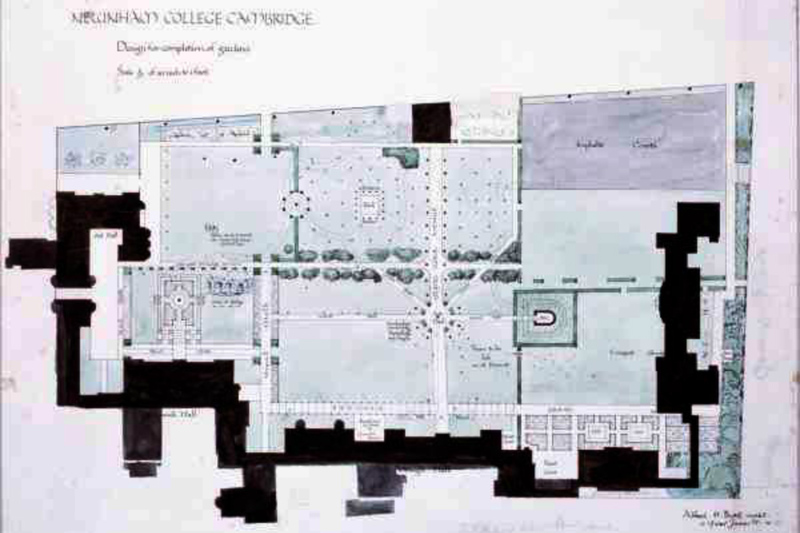 The College engaged James Backhouse & Son of York to draw up a plan for the gardens (Plan 1). At this time, Newnham Walk still ran through the College past Sidgwick hall to Grange Road, although the College was negotiating with the City to have it closed as a right of way, and replaced by a new road to the north of the College. The new road, Sidgwick Avenue, was built and in 1894 the College site was unified. The gardens did not follow the Backhouse plan exactly, or any of other plans that were commissioned subsequently; like the buildings, they just grew. The Founders were too busy with the welfare of their clients, women wanting accommodation and education, to worry particularly about the gardens. Although from the beginning the gardens were a core feature of Newnham life – there was to be no theory of quadrangles or grandeur for Newnham. Strict practicality was the watchword. The first Principal, Miss Anne Jemima Clough, declared that ‘students must have fresh air, exercise, and wholesome food’ but the garden could take care of itself. An orchard was planted, pigs, and chickens were kept, and tennis courts proliferated round the steadily increasing number of buildings. The gardens continue to evolve as different parts of the college are developed. For example, the Mound was originally created in 1891 as the site of the observatory. The observatory was moved to its present position on the playing field when Peile was built and blocked the view of the heavens. A memorial to the Principalship of Mrs Sidwick was erected on the mound in 1914. The planting of the Mound was redesigned in 2009 when a knot garden was created. In 2013 when the Iris Collection was developed iris borders planted around the Observatory were created. Four plans of the college gardens are known to exist.